40 yachts will set sail for the first ever Wave Week, a seven day hedonistic adventure across the Adriatic coastline, anchoring at seven separate idyllic locations along the way. Expect sun drenched day’s of relaxation, rejuvenation and adventures, then as the sun sets, the islands will become a party lovers paradise for the night. Wave week begins with a bang as we sail to the official welcome party at Supetar beach bar, Roso Beach Club. Here we will watch the sunset over the Adriatic sea and dance until the early hours to some deep Chicago sounds with Need2Soul. Day two in paradise commences with a party on the high seas where our convoy will unite for the Circle of Sound. 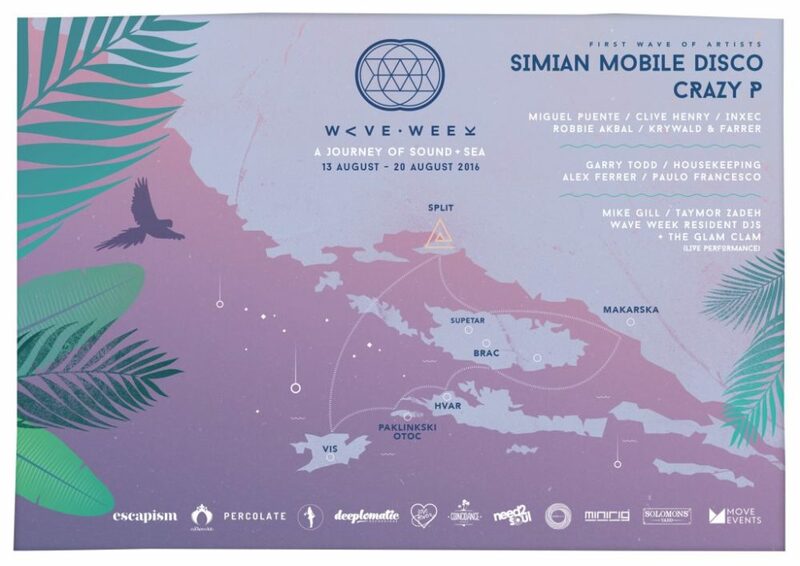 We will then sail to Makarska where Percolate will host a night at Deep, a hidden underground nightclub, nested in a cave with music from Simian Mobile Disco, Crazy P and Krywald and Farrer. Day time adventures at Croatia’s most famous beach are combined with all day and night parties that will take place at Auro and Varadero beach bars with music from a selection of our best DJs including Clive Henry and Miguel Puente. More to be announced soon.. Exclusive mooring at Croatia’s most famous party island, here Deeplomatic Recordings will play into the evening as Housekeeping take on the night with music, mayhem and frivolous revelry. A day of rest and relaxation at the luxurious beach bar at Laganini. Here you can enjoy spa treatments, explore the local area and cuisine before regenerating in preparation for another day on the sea. Explore the Island of Vis by day and prepare for the ultimate supper club experience from Glam Clam, a flamboyant combination of cabaret and cuisine, followed by an extravagant Wave Week finale hosted by Londons’ celebrated Cuckoo Club at Fort George; an open air fortress turned nightclub. DJs to be announced very soon. Our day to night itinerary explores the realms of music and adventure. From partying till dawn in the hidden caves of Markasa to snorkelling around the coves of Vis, ticket holders will undergo a totally unique and beautiful festival experience. We have located the most unique and exceptional restaurants, clubs and bars along the way, from beach bbq’s to sit down supper-clubs, a new experience is to be had every single day.